This new volume, Information Security Management Systems: A Novel Framework and Software as a Tool for Compliance with Information Security Standard, looks at information security management system standards, risk management associated with information security, and information security awareness within an organization. The authors aim to improve the overall ability of organizations to participate, forecast, and actively assess their information security circumstances. It is important to note that securing and keeping information from parties who do not have authorization to access such information is an extremely important issue. To address this issue, it is essential for an organization to implement an ISMS standard such as ISO 27001 to address the issue comprehensively. 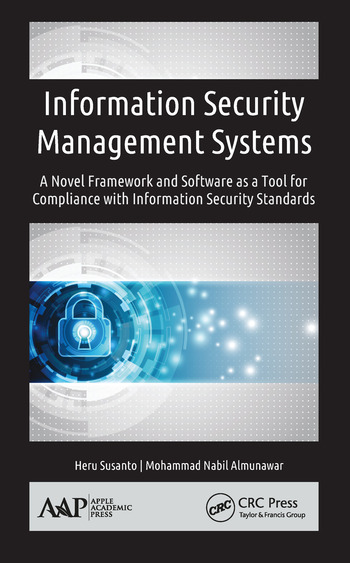 The authors of this new volume have constructed a novel security framework (ISF) and subsequently used this framework to develop software called Integrated Solution Modeling (ISM), a semi-automated system that will greatly help organizations comply with ISO 27001 faster and cheaper than other existing methods. In addition, ISM does not only help organizations to assess their information security compliance with ISO 27001, but it can also be used as a monitoring tool, helping organizations monitor the security statuses of their information resources as well as monitor potential threats. ISM is developed to provide solutions to solve obstacles, difficulties, and expected challenges associated with literacy and governance of ISO 27001. It also functions to assess the RISC level of organizations towards compliance with ISO 27001. The information provide here will act as blueprints for managing information security within business organizations. It will allow users to compare and benchmark their own processes and practices against these results shown and come up with new, critical insights to aid them in information security standard (ISO 27001) adoption. Heru Susanto, PhD, is currently the head and researcher of the Computational Science & IT Governance Research Group at the Indonesian Institute of Sciences. He is also an Honorary Professor and Visiting Scholar at the Department of Information Management, College of Management and Hospitality, Tunghai University, Taichung, Taiwan. Dr. Heru has experience as an IT professional and as web division head at IT Strategic Management at Indomobil Group Corporation. He has worked as the Prince Muqrin Chair for Information Security Technologies at King Saud University in Riyadh, Saudi Arabia. He received a BSc in Computer Science from Bogor Agricultural University, an MBA in Marketing Management from the School of Business and Management Indonesia, an MSc in Information System from King Saud University, and a PhD in Information Security System from the University of Brunei and King Saud University. His research interests are in the areas of information security, it governance, computational sciences, business process re-engineering, and e-marketing. Mohammad Nabil Almunawar, PhD, is currently a senior lecturer and the Dean of the School of Business and Economics, Universiti of Brunei Darussalam (UBD), Brunei Darussalam. Dr. Almunawar has published more than 60 papers in refereed journals, book chapters, and presentations at international conferences. He has more than 25 years of teaching experience in the area of computer and information systems. His overall research interests include applications of IT in management, electronic business/commerce, health informatics, information security, and cloud computing. He is also interested in object-oriented technology, databases and multimedia retrieval. Dr. Almunawar received his bachelor degree in 1983 from Bogor Agricultural University, Indonesia; his master’s degree (MSc in Computer Science) from the Department of Computer Science, University of Western Ontario, London, Canada, in 1991, and a PhD from the University of New South Wales (School of Computer Science and Engineering, UNSW), Australia, in 1998.